I'm delighted to announce that one of my short stories has been published in Deadman's Tome. 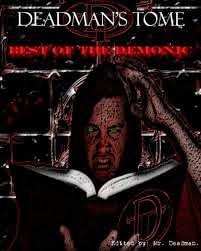 This is an online horror ezine that is published monthly for those who like their horror dark and morbid. "Lost, but not forgotten. Discarded, but not abandoned. Rumor has it that somewhere deep in the dark abyss lies an ancient relic of wicked men, a product of madness. A tome of horrors so unimaginable, so unfathomable that a few lines was all it took for people to go mad. There are documented accounts of this book shattering families, tearing through the strongest of examples of love, causing mothers and fathers to devour their young. Somewhere, lost in the ocean of misinformation, exist reports of small towns cursed with mass hysteria, mass murderous delusions, consumed by either fire, cannibalistic orgies, or both. Every time, this ancient tome, the very book you are reading, was found beneath the rubble. Of course, this is only a copy, and only a fragment of the original tome. Any curse or dark spirit that haunted the original shouldn’t possess a mere replica. You should be safe, but if you begin to see shadows in the dark, smell burning from the walls, and hear voices outside your windows, then do not continue. You have been warned."